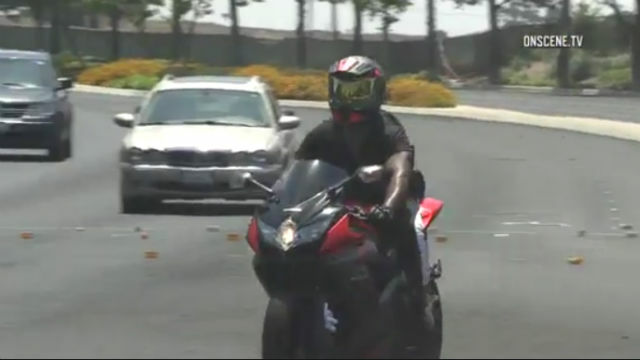 A motorcyclist who refused to yield for a traffic stop in Serra Mesa led authorities on a roundabout road chase that ended with his arrest at a San Ysidro home, where he stopped under the apparent belief that he had eluded his pursuers. The man fled when a California Highway Patrol officer tried to pull him over for speeding on Interstate 805, near state Route 163, shortly before 11:30 a.m., CHP spokesman Jim Bettencourt said. The motorcyclist tore away to the south at speeds exceeding 100 mph, Bettencourt said. The state patrolman gave chase for several minutes, then backed off for safety reasons in the area of University Avenue in North Park. A San Diego Police helicopter crew then took over the pursuit, tracking the reckless rider’s path from above and keeping ground units apprised the progress of the chase as the motorcyclist kept speeding over various freeways, including Interstate 5 and SR-52. “He pretty much took us on a tour of the South Bay,” Bettencourt said. Finally, at about noon, the man pulled into a garage in the 1600 block of La Mariquita Senda, near the junction of I-805 and SR-905, and closed the door behind him. A short time later, officers arrived at the home, contacted the man and took him into custody without further incident. His name was not immediately available.